I've actually done a spot of fishing - not, I have to say with any great success, but at least I caught something. I went to the coast for an hour one morning (just a gentle stroll I have to say) and then I had a couple of sorties to the rivers. My saltwater trip was not very productive. In fact I met my pal Bill who had decided to give the same spot a try and turned up just after me. I was encouraged at first when a bite, in the dark, produced a little, wriggling pollack but two more pulls were missed - probably more pollack I supposed. For the next half-hour neither Bill nor I had anything other than the odd desultory tug on the lure. I decided to go on but couldn't resist a last chuck or two and I was surprised to get a good bite - which didn't stick. After that I fished on for a little while but had no more bites. My river fishing was a little more productive. 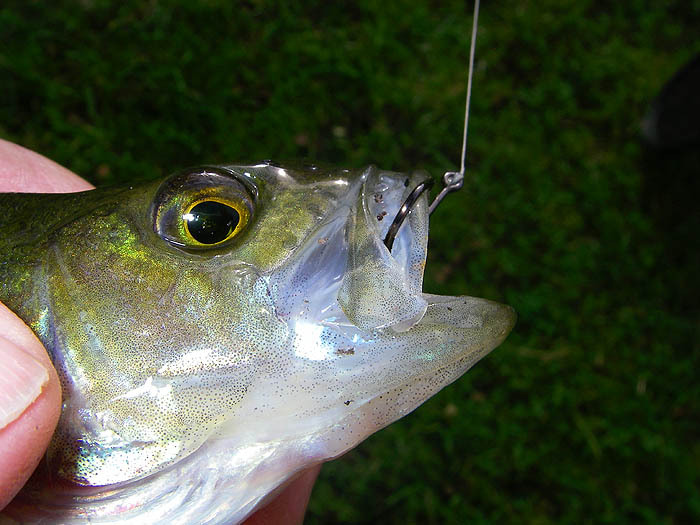 I opted to try freelining live minnows on a small circle hook (the method that produced me a chub on an earlier trip). I had no bother catching minnows, although it was a bit of a fiddle taking two rods and a bucket for the bait. 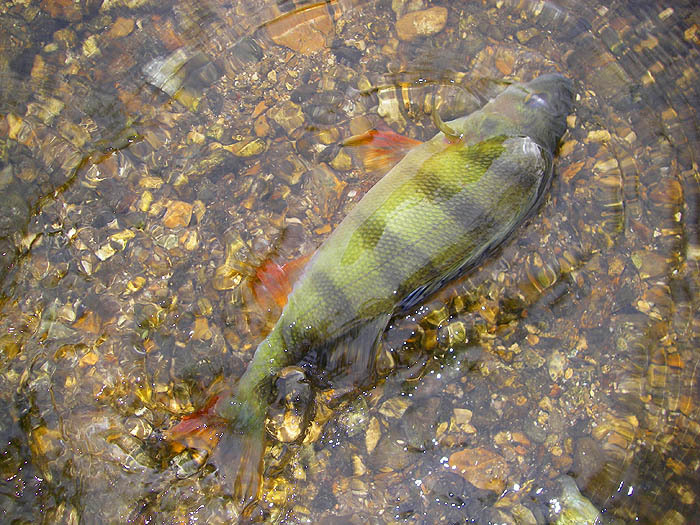 I began by flicking the minnow across a shallow glide and this produced a few perch up to almost a pound - nice! Then I walked down to a shallow, fast flowing run and lobbed the minnow to the reed lined, far bank. Almost at once the line tightened and the rod tip began to jerk. 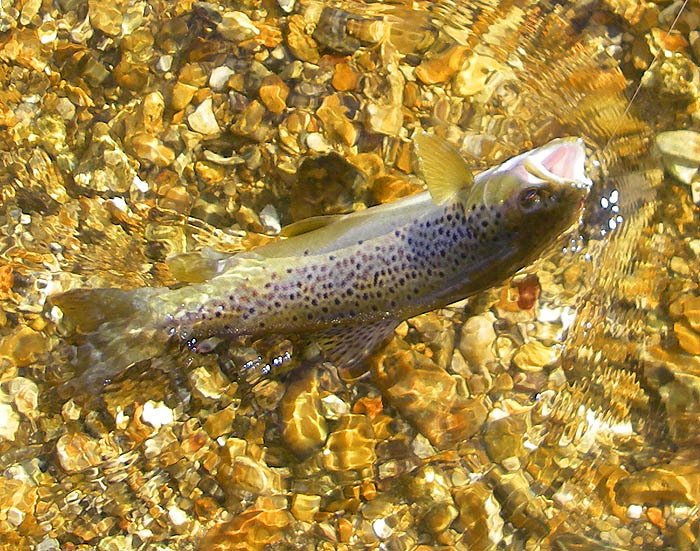 I wound down gently and a decent trout of perhaps three pounds hurled itself into the air. After a fine show of acrobatics I had the fish almost at my feet so I unshipped the little camera and - blow me down! - the trout came off. I said a few choice words and, more in hope than in expectation, cast again to the same spot. I allowed the minnow to trundle downstream with the current and within seconds it was taken by another trout - a lot smaller than the first one. I landed this fish and took its picture before releasing it. Excellent! My success with the live minnows encouraged me to have an evening trip after seatrout, which seem to be abundant in my local rivers at the moment. I fished single maggot for the minnows and, in the process managed to catch a couple of small trout and a seatrout of perhaps a pound-and-a-half. As it got dark I began to see bow waves of (persumably) feeding trout all over the place. I began to fish with my livebaits but nothing showed even the slightest interest. My pal Adrian, who'd been fishing the same stretch earlier in the day, tells me he had a brown trout and two seatrout on float fished maggots. His best fish was five-and-a-half pounds - so much for my minnow fishing hypothesis. 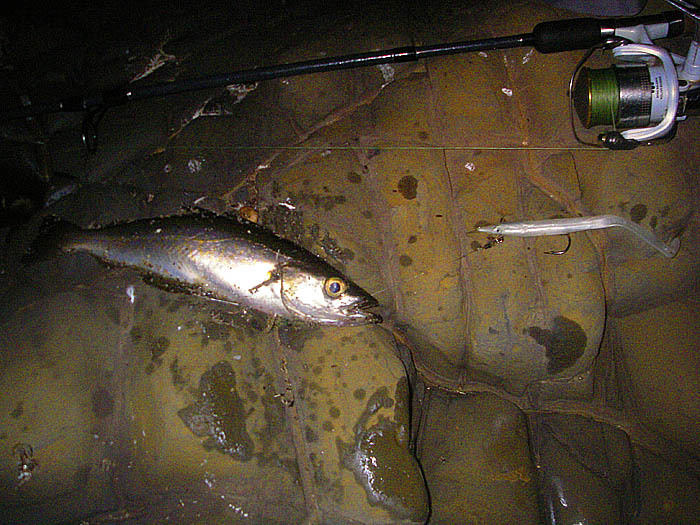 Nevertheless I KNOW that the trout eat small fish at night so I may well have another go before the end of the season.